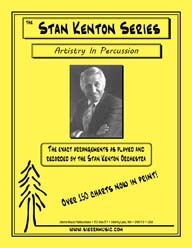 As recorded by the Stan Kenton Orchestra on "Artistry in Rhythm" (and many other CDs). This historically important piece opens with a rubato piano solo and then moves to a terrific Rugolo trombone feature (originally recorded by Kai Winding). From the Progressive Jazz period in the 1940's, this piece focused on the alto saxophone (originally played by George Weidler). Another amazingly futuristic piece from Rugolo's great mind. Recorded in 1947 and included in the Milestones LP, this piece is a gorgeous melody (one of Pete's best known). Kenton had many hits over the years, and this very creative arrangement by Pete was one of them. This is one of the early, fantastic Latin charts recorded by the Kenton Band and played for years and years. The original chart as played by the Stan Kenton Orchestra. This chart has appeared on a couple of different albums over the years (Kenton Classics and Hits).